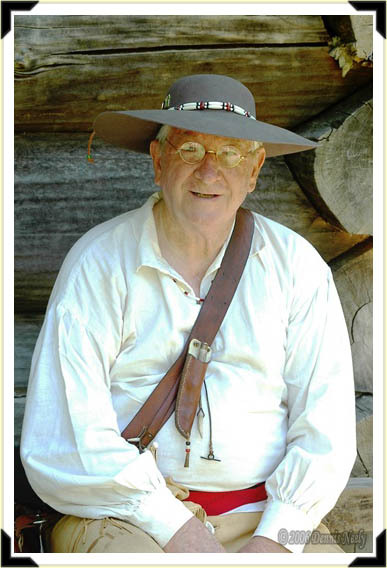 With a warm smile and a twinkle in his eye, David Burgess rested against the blockhouse at the NMLRA’s Max Vickery Primitive Range in Friendship, Indiana. We met at the woodswalk, and we became instant friends. Every time one of my articles appeared in Muzzle Blasts, David sent a congratulatory email acknowledging a job well done. We shared traditional hunting stories, and in recent years, tales of his trials and tribulations with a new fowler. David Burgess passed away October 19, 2017. Please include David, Barbara and his family in your prayers. This entry was posted in Snapshot Saturday and tagged Mountain Man. Bookmark the permalink. My prayers and condolences go out to Mr. Burgess, his family and all who knew and loved him.